Attention to detail and exceptional service make every couple's dream wedding a reality at Pinnacle Golf Club. With numerous event areas throughout the property, wedding couples can create memories that will last a lifetime from a festive bridal shower to an intimate farewell brunch. The versatility of the Pinnacle Golf Club makes it suitable for a romantic and relaxed event for 10 guests or a grand formal affair for up to 400. With a blend of both outdoor areas and indoor spaces, Pinnacle has something for every wedding couple's needs. There are six event areas around the property, making it perfect for both a ceremony and reception. Wedding ceremonies can be held in the private outdoor courtyard, also known as the Bride's Garde, which offers 3,000 square feet of groomed lawn that can accommodate up to 300 seated guests in a theatre-style setting. Receptions and pre and post-wedding events can take place in one of five event spaces that can be found throughout Pinnacle. Cimi's Bistro is the on-site restaurant and offers 2,000 square feet of indoor and outdoor space that can seat up to 300 wedding guests. Two private dining rooms are available at Pinnacle Golf Club that are perfect for more intimate receptions and parties. The smaller of the two spaces is just over 350 square feet and can seat up to 35 guests. The Loft is an additional private dining space that encompasses 1,500 square feet that can serve up to 85 dining guests. The Pinnacle Grand Ballroom is the largest reception area on the property with over 10,000 square feet of event space. This area can accommodate up to 400 guests for a seated reception and also has a spacious 40' by 40' entertainment area. The ballroom leads to a 1,500 square foot rooftop terrace that can fit up to 85 people for a cocktail area or seated for a small reception or dinner. 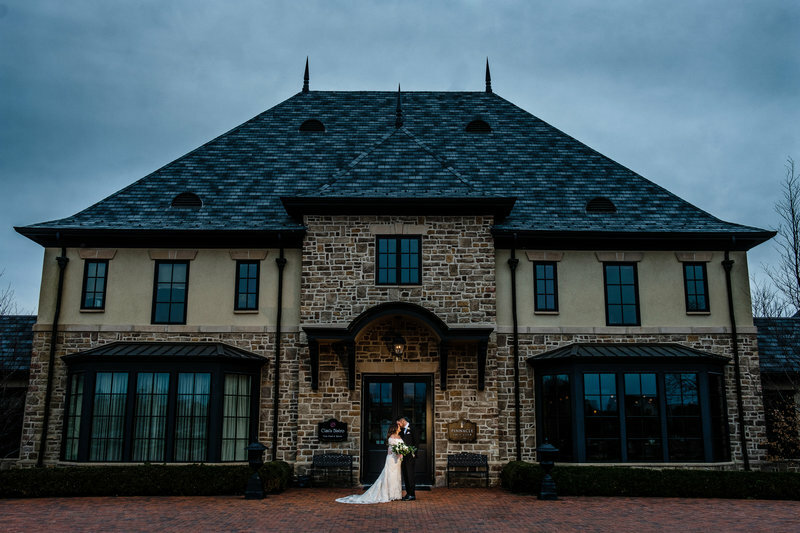 In addition to the event spaces, Pinnacle Golf Club offers on-site catering, a bridal suite and an in-house wedding planner that can coordinate all details including various event sites, equipment, and menu options. According to the event planning staff at Pinnacle Events, rental prices for the Grand Ballroom start at $2,500 and offer access to the terraces, a private entrance, and a private bar. This price includes a one-hour cocktail party and five hours for the reception and includes set up and tear down, table decor, linens, an entree tasting, and twenty-five guest tables. A ceremony rental fee starts at $1,400 and includes the set up of up to 300 seats and tables and linens for a post-ceremony cocktail hour. Food and beverage minimums start at $3,000 with pricing determined by the month and day of the event. Open since 2006, Pinnacle Golf Club has quickly established itself as one of the premier wedding destinations in the area. Set on an award-winning golf course, Pinnacle is a breathtaking location, from the meticulously-maintained gardens to the stunning views from numerous vantage points throughout the property. Wedding guests arrive along a garden-draped driveway that makes its way to the stately stone manor that stands as the centerpiece to this incredible property. A beautiful porte-cochère serves as the entryway to the magnificent Pinnacle Grand Ballroom which is filled with intricately-designed chandeliers and marble floors. The ballroom is light and bright with walls of windows that offer panoramic vistas of the countryside, from the idyllic streams to the clusters of sycamore trees along the vast property. 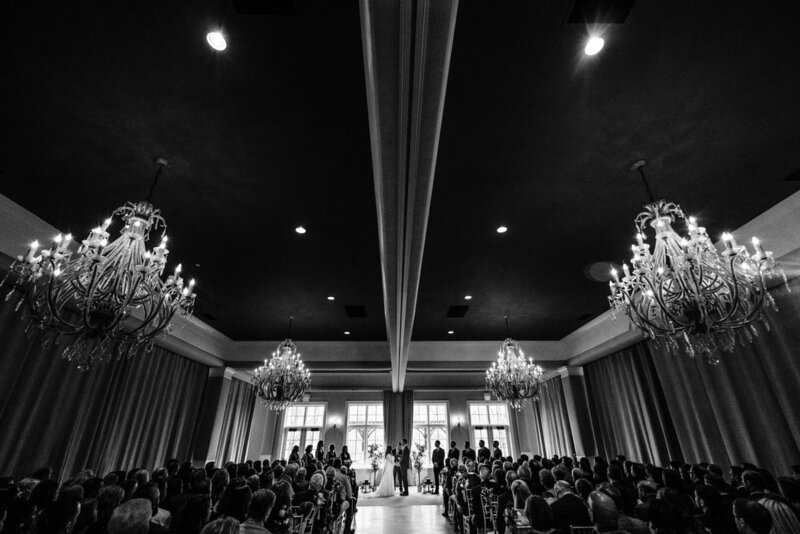 Click to see Malena & Jason's incredible wedding at Pinnacle Golf Club. Click to see Lindsay & Tom's incredible wedding at The Ohio Statehouse.